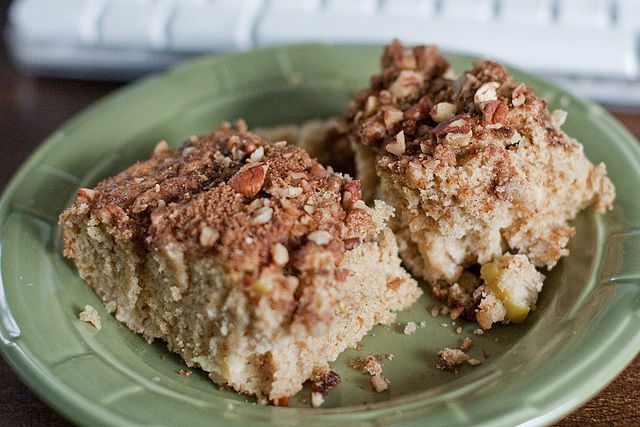 Learn how to make Polish coffee cake or placek z kruszonka, a simple, sweet yeast-raised cake with a crumb topping. This dish requires a fair amount of elbow grease and hard work; if you have a strong arm and wrists, try making this by hand. Otherwise, a stand mixer will do nicely. Place sugar and butter in a large bowl or stand mixer. Scald the milk and pour it into the bowl with sugar and butter. Stir until butter is completely melted. Let cool to 110 F.
Add yeast and mix well. Add egg-salt mixture and half the flour, stirring constantly. Add the vanilla and raisins, if using, and mix well. Add the remaining flour and mix well. The dough will be sticky. Turn out into a greased bowl and cover with greased plastic wrap. Let rise until doubled. Grease two (9-by-5-inch) loaf pans and make the crumb topping in a medium bowl by combining flour and sugar, and cutting in the butter with your fingers. Set aside. Using slightly dampened hands, punch down dough and divide it in half. Place in prepared pans. Sprinkle half the crumb topping on each cake. Place on a baking sheet to catch any crumbs that fall off while baking, cover with greased plastic wrap, and let rise until dough mounds slightly over the top. Heat oven to 300 F and bake for 50 minutes or until the instant-read thermometer registers 190 F.
Remove from oven and cool in pan for 5 minutes. Then turn out and cool coffee cakes completely on their side on a wire rack.